Music education is an on-going, cumulative process, and is not taught “by the lesson”. The commitment to you and/or your children is a continuing one; this means more than simply being there at the lessons. It means committing to, taking and interest in, and actively considering the needs of each student and family in the studio. “Behind the scenes” I continually update my teaching strategies; I attend conventions and workshops for new ideas; purchase new music, accessories and equipment; I repair and maintain existing equipment; loan music and instruments to students; I maintain memberships to numerous professional organizations; organize and attend regular recitals, rehearsals, master classes, book guest teachers for these events, among others. I teach high standards using positive reinforcement in a non-judgmental environment. I believe that music should be an integral part of any child’s education and upbringing regardless of socio-economic background. I hope to instill the love of music in all of my students, and to inspire and encourage musicians of all ages to bring out the full potential within them. I expect dedication, focus and effort, and in return I provide support, guidance, and insight. I will work to encourage thought and self-awareness in students, and most importantly I will teach students how to become their own teachers, solve problems on their own and become independent learners. I aim to foster friendships and mutual support between my students. I strive to teach students to find their own musical voices, to enrich their lives to the fullest through music, as my own mentors have done for me. 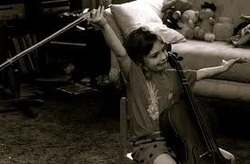 The "by-products" of cello lessons are equally important in the learning process: discipline, creativity, problem solving, team work, attention to detail, spatial awareness, aesthetic development, self esteem, thinking skills, brain development, and many more. I aim to be available to answer questions and give advice during lessons, and through email/phone.